The first step in Akron Children’s new medical tower’s main pedestrian thoroughfare has been set in place. 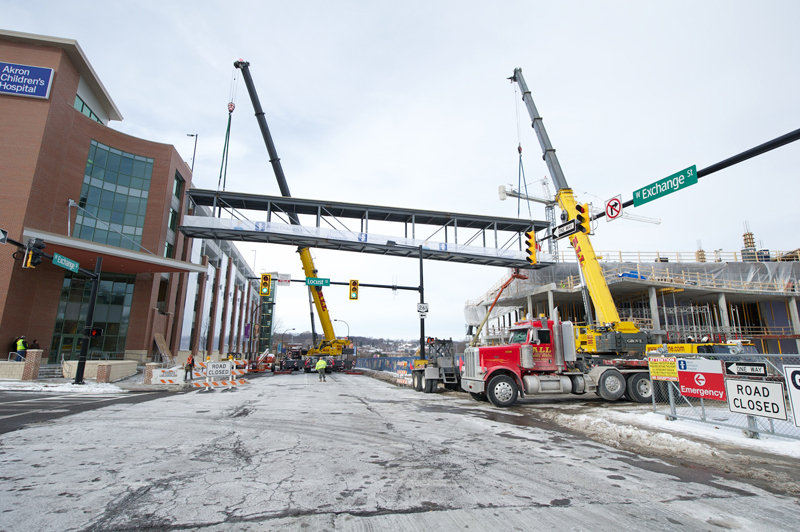 Crews spent 10 hours this past Saturday, Jan. 4, hoisting the 62-ton, 130-foot long pedestrian bridge into its final resting place, which connects the already completed parking garage to the tower’s 3rd floor outpatient surgery center main lobby. Planning for the construction of the pedestrian bridge began 2 months ago. The bridge was shipped to the job site in 6 separate parts, where a steel fabricator then welded the pieces together. On Jan. 4, beginning at 6 a.m., crews closed down Exchange Street and redirected traffic, while a crane raised the bridge and workers attached it to the buildings. Then, a certified inspector thoroughly examined all the welded and bolted connections to ensure no hazards existed to traffic below the bridge once the road re-opened. Though crews battled an inconsistent westerly wind, everything went off without a hitch. Now that the shell is in place, crews will get to work finishing the bridge’s glass enclosure and interior work. Once completed, the pedestrian bridge will boast an innovative colored lighting system that will direct patients and families to the tower and eventually further to the existing hospital’s main lobby. Construction to further extend the connection to the existing hospital will begin in late February.